TriTalk.co.uk :: View topic - What? No SPOTY thread? Posted: Sun Dec 18, 2016 9:05 pm Post subject: What? No SPOTY thread? To quote a famous tennis player: "you cannot be serious"
It's a TT tradition. Moaning about the lack of personality and the pointless debate of who has and hasn't got a personality. Does any sportsperson have a personality? I reckon AB benefited from the fact that the "short list" was 16 names long. Andy Murray was always going to be a hot favourite after the year that he's had, but the vote for the other contenders would have been so thinly split that a bit of concerted effort would have made it relatively easy for a sport to get its' contender "on the podium"
Who wins it next year? I reckon Joshua or Farah. Not sure what Froome has to do to get on the shortlist. A professional football team winning team of the year is just wrong. As opposed to what - a professional rugby team, a professional cricket team, a professional tennis team (Davis Cup)? I mean, imagine, a team playing the most popular and competitive team sport in the world winning a sports team competition. Ridiculous. renaming it "Sports Person of the Year" would overcome many objections to Murray winning this. he's no personality but you can't deny he is a superb sports person who has had a superb year. 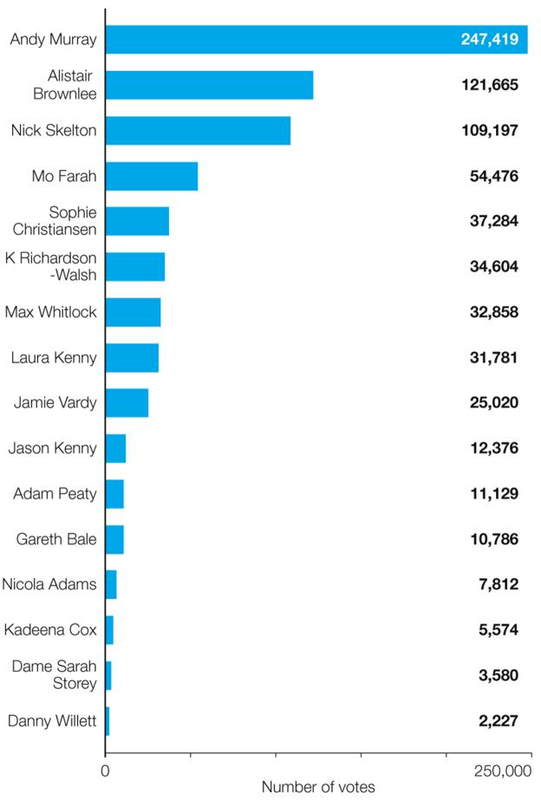 I'm really surprised that Laura Kenny didn't place higher to be honest.